Obviously, the most logical next step would be to take out your phone, navigate to your contacts, dial up your parents and politely ask them to bring you frozen home cooked meals. They happily agree and everyone lives happily ever after. The end. Clearly, I am joking because I received an immediate “No” followed by some laughter from my parents. Quick side note, if you were considering this option, I hate to be the bearer of bad news, but it probably isn’t going to work out. Now, take this from somebody who has experience being in your position. 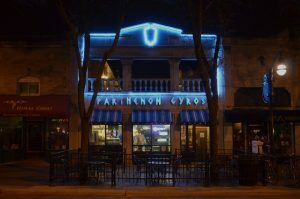 I am not kidding when I say that Parthenon Gyros has some of the best food in Madison. They make the most mouthwatering handmade gyros west of the Mississippi, with real food made with real ingredients. Even if you have never tried Greek food before, I strongly recommend marching down State street to Parthenon. You won’t be disappointed.